The Breckwell Classic Cast P4000 was previously known as the Breckwell Vermont. The hopper size has increased from 40 to 50 lbs. 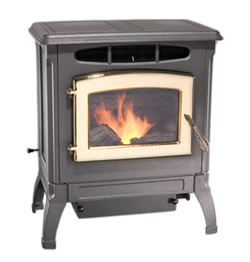 This is a refreshingly uncluttered cast iron stove which is freestanding on cast iron legs. The Classic Cast has a large ashpan for a stove of this size, it is recommended to be emptied only after burning a ton of fuel. This stove has a burn time of 50 hrs, and gives out 42,000 btu. per hour, but see comments below about running on the high heat setting. Heating Area 1,500 sq. ft.
Max. Heat Output 42,000 btu. Fuel Type Preferably premium pellets, but will burn standard. Window Size 11.5 in by 7.5 in. It's recommended that the Breckwell Classic Cast not be run for more than an hour at a time on the high heat setting. Some problems with the A-E-033 convection fan seizing. This is being replaced with the C-E-029 fan. Try to make sure the newer fan is fitted. If you would like to leave a review of the Breckwell Classic Cast, please use the form on the contact page.